The solvent versatility of Chiralpak IA (amylose tris(3,5-dimethylphenylcarbamate)), Chiralpak IB (cellulose tris(3,5-dimethylphenylcarbamate)) and Chiralpak IC (cellulose tris(3,5-dichlorophenylcarbamate)) immobilized onto silica gel, are investigated for the enantioselective separation of a set of acidic drugs in liquid chromatography. Non-standard LC organic solvents like dichloromethane, ethyl acetate, tetrahydrofuran, methyl-tert-butyl ether were used in mobile phase compositions and/or diluent agent for the analyte on all new columns. 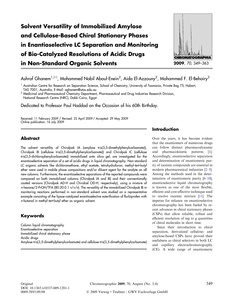 Furthermore, the enantioselective separations of the reported compounds were compared on both immobilized columns (Chiralpak IA and IB) and their conventionally coated versions (Chiralpak AD-H and Chiralcel OD-H, respectively), using a mixture of n-hexane/2-PrOH/TFA (80:20:0.1 v/v/v). The versatility of the immobilized Chiralpak IB in monitoring reactions performed in non-standard solvent was studied on a representative example consisting of the lipase-catalyzed enantioselective esterification of flurbiprofen with n-butanol in methyl-tert-butyl ether as organic solvent.